Welcome back to our blog series on vacation trends! As an FDIC-bank and the nation’s leading choice in non-recourse loans, we are dedicated to keeping a finger on the pulse of types of investing trends. In the world of real estate investing, this is an excellent time to act on turning a property into a vacation rental. Not only will you have a property that could turn a profit over an extended period of time, you’ll also have a property that makes you money in the meantime via renting it out to travelers. All you need to do is use the funds in your self-directed IRA in correspondence with a non-recourse loan from First Western Federal Savings Bank to make this happen! We’re ready to help you whenever you’re ready to start. 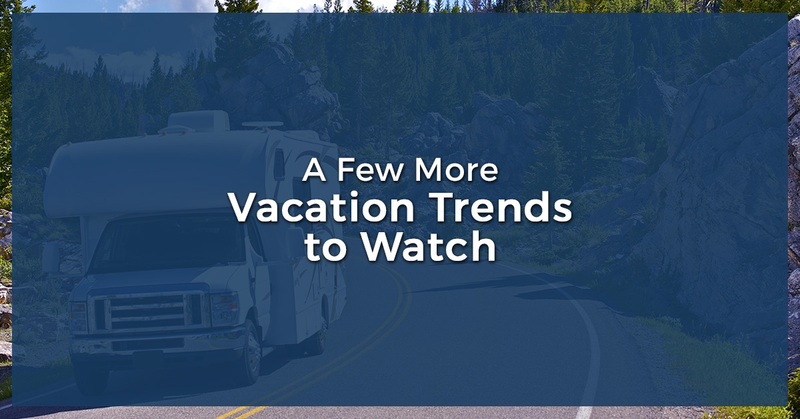 Take advantage of these growing vacation trends, and get started on applying for a non-recourse loan! Traveling has always been seen as an expense, but in more recent years, people and travel businesses alike have found ways to cut back on costs. Many people opt to fly with airlines like Frontier and Spirit, where the ticket price is substantially cheaper — provided you don’t plan on bringing additional baggage. If travelers can get by without checking a bag, this has proven to be a lucrative option for seeing the sights without paying the price. Some researchers predict this trend will continue to increase in popularity in 2018 and the coming years. If this means anything, it shows that the industry is adapting and evolving to meet the needs of the growing interest in traveling. It might seem surprising, but currently, the United States is the second most popular destination among millennials. Domestic travel continues to be highly popular, but even from a global level, people are still looking to travel to the United States. It comes as no surprise, then, that the United States generated over $1.5 trillion dollars in tourism in 2016. In terms of a non-recourse loan, this serves as further inspiration to invest in the real estate market. When you turn your property into a vacation rental, you’ll be able to generate further profit — as well as hold onto an investment that appreciates in value over time. As a wise Dorothy Gale once said, “If I ever go looking for my heart’s desire again, I won’t look any further than my own backyard.” This coincides pleasantly with the idea of staycations, where people don’t travel far — or even outside of their own city — to get away. With the amount of people looking to experience a staycation up 70 percent from 2016, it goes to show that travelers want to see more aspects of the places they live. Staying in cool vacation rental properties, such as tree houses, yurts, or unique and quirky homes, has added to this appeal of seeing much without going far. If you’ve been passing by that eclectic house on the corner — the one with the stained glass windows and the round wooden door, reminiscent of something out of the Shire — and suddenly notice a “For Sale” sign out front, this might be the time to invest. You could work in correspondence with First Western Federal Savings Bank to get a non-recourse loan to purchase that ethereal-looking house, and turn it into the perfect staycation destination. This generation gets a reputation for many things, but if there’s one thing that millennials are increasingly becoming known for, it’s travel. In fact, The Atlantic reports that “We [millennials] are now the fastest-growing age segment in terms of the money we spend on travel, according to American Express Business Insights.” It’s a slightly interesting statistic and trend, considering that millennials are often considered to be suffering the most from the state of the economy and job market. Nevertheless, 20- and 30-somethings are more prone to spend money on traveling, and this trend is not showing any signs of slowing down. For certain age groups and demographics (such as millennials), there are higher interests and trends with traveling abroad. However, a 2017 study showed that 85 percent of trips taken by people in the United States were domestic in nature. The overwhelming number of people traveling are staying in the United States. This isn’t all that surprising, either. The United States is one of the largest countries in the world, and has incredibly diverse and different ecosystems, cities, and regions to explore. With 50 states, it’s more rare than common for someone to have visited them all. Ultimately, travel continues to be an extraordinary popular endeavor, making now the perfect time to capitalize on the opportunity to build your financial future. By investing in real estate (with the help of a non-recourse loan from First Western Federal Savings Bank), you can create a vacation rental to meet the demands of this ever-growing market. Our non-recourse lenders would love to work with you. Find out more about getting a non-recourse mortgage from First Western Federal Savings Bank, and get in touch with our team!